A new report documents incidents of bigotry and suggests fighting bad speech with counter speech. As it turned out, the killer was not Muslim, and the motivations for the assault were not terrorism. But this did not stop the backlash from reaching the Muslim-American community. Although Dollard received criticism from a few media outlets, his actions were never formally punished. As of this writing, he has neither deleted nor apologized for the tweet, despite being told that several Muslim Americans felt offended and threatened by it. When it comes to online hate speech against Muslims, this is frequently the case. Dollard’s tweet is only the most recent high profile case in a string of online bigotry and violent hate speech against Muslims living in the United States, the vast majority of which often goes unpunished and unaccounted for, even when voiced by public figures. It’s in this context that Muslim Advocates released a report titled Click Here to End Hate: Anti-Muslim Bigotry Online & How to Take Action. The report breaks down perpetrators of Islamophobic hate speech into three categories: public officials, hate groups and activists, and individuals. On the Internet, there are approximately 11,500 websites devoted to anti-Muslim hate, not including isolated posts. In addition to politicians and other public officials using their platforms to advance stereotypes about Islam and sway their constituents’ perception of Muslims and Muslim-Americans, there are several independent hate groups and “Celebrity Islamophobes” with large online followings. 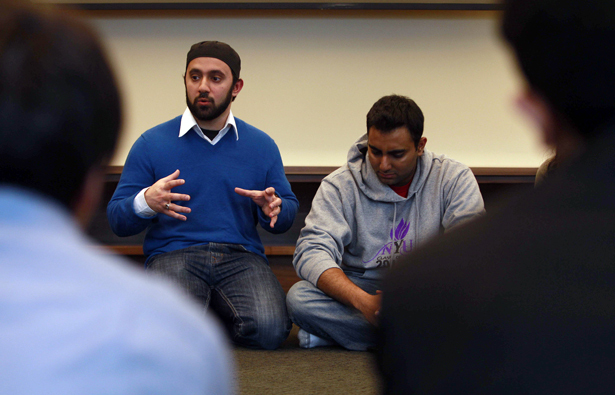 Although some of these groups are exclusively online, many galvanize their supporters into offline actions that often have real-life consequences for the Muslim community. The most notorious example of this is Pamela Gellar’s Stop the Islamization of America, a group that, shortly after forming in 2009, galvanized enough support to oppose the Park 51 “Mosque at Ground Zero” bringing thousands of right wing activists to the streets of lower Manhattan, and Gellar and her organization’s agenda to the national spotlight. These protests, although relatively short-lived, changed the perception of Muslims in the United States. A 2010 Public Religion Research Institute study showed that 49 percent of Americans believed the values of Islam were incompatible with the American way of life, a notable increase from previous studies. Hate crimes against Muslim Americans and vandalism and arson attacks on mosques leapt to an all-time high. Although Geller has not necessarily made mainstream news headlines since then, her personal Facebook following has exploded from 19,000 to over 78,000 in the past year alone. It doesn’t take a celebrity Islamophobe like Geller or notorious right-wing commentator like Patrick Dollard to stir anti-Muslim sentiment in the community. Smaller blogs, particularly ones focused on local communities can have serious and violent repercussions. One of the most common—and sinister—examples is online bullying amongst high school students. After the assault, the students who attacked her were talking and bragging about it online. Should the Internet be regulated? Legally, hate speech is too loosely defined to fall squarely inside or outside of the First Amendment. Although the First Amendment includes caveats, such as speech that could “incite” violence or be deemed threatening, it is difficult to pass comprehensive laws that address all forms of hate speech to make a meaningful impact. What about the Internet companies? As private companies, online platforms like YouTube, Twitter and Facebook can enforce regulations on content that are not as beholden to the First Amendment as they would be coming from Congress. Still, with an average of 58 million tweets and 4.75 billion pieces of content shared on Facebook per day, it would be nearly impossible to monitor everything. Ahussain defines counter speech as anything ranging from promoting positive portrayals of American Muslims to holding public officials who engage in hate speech accountable. Sabina Mohyuddin, a board member of the American Muslim Advisory Council in Coffee County Tennessee engaged in counter speech concerning an incident with county commissioner Barry West. Last year, West posted a picture on Facebook of a man cocking a gun straight at the camera. It was captioned “How to Wink at a Muslim.” After many members of the Tennessee Muslim community called and voiced their outrage, West issued an apology. “We were happy that he apologized, but we felt like we needed to do more than just get an apology. He needed to understand who we were,” Mohyuddin told The Nation. Inspired by their dialogue, Mohyuddin planned a public forum called “Public Discourse in a Diverse Society” so that more of Coffee County could get to know the Muslim community. News of the forum went viral, and 1,000 came from across the country to protest, including top level Islamophobes like Pamela Geller and Robert Spencer. Barry West was in attendance.